In concluding the previous post, I pointed out the problem with comparing stock-based energy sources—such as fossil fuels and uranium—with flow-based sources—such as wind and solar radiation—on the basis of their associated energy densities. [Update: strictly speaking, we’re dealing here with the distinction between energy density and power density. While energy density is a straightforward and very useful way to characterise and compare energy storage media such as fuels and batteries, the infrastructure for producing fuels and electricity is often better characterised in terms of power density—the rate of energy transformation or supply per spatial unit. This reflects the more immediate dependence of a particular set of socio-economic arrangements, if it’s to be maintained, on its associated energy supply rates, rather than its energy reserves. For now though, I’ll continue the inquiry based on the concept of energy density, as it is arguably the more accessible concept given the nature of our direct experience with fuels—including our own fuels, the food that we eat!] Just to recap on the previous post, establishing a characteristic energy density for a given source requires that we first nominate an appropriate spatial dimension associated with that source. This is straightforward for stock-based sources involving a given quantity of material such as coal, oil or gas, and we can readily compare the energy densities between different sources. The characteristic spatial dimension is the volume occupied by the source material. In the case of flow-based sources—which means in effect all renewables with the exception of biomass—the situation is more nuanced. It’s certainly useful to think about flow-based sources in terms of energy density, but what this means, and what its determination entails in practice, varies between sources. With flow-based sources, energy density is useful for comparing between different sites or conversion technologies for a given source, rather than for drawing direct comparisons between sources of different physical origin. Wind, solar radiation and wave energy flows provide a good illustration of this. For wind, volumetric energy density does have some direct relevance, and so we can make superficial comparisons with fossil energy sources. The problem with this is that, unlike stock-based sources, wind energy density varies with wind speed, and hence with energy flow rate. Direct comparisons between wind and stock-based sources on the basis of energy density also break down due to wind energy being accessed at the immediate location at which it’s converted to useful mechanical work. Stock-based sources such as fossil fuels, on the other hand, require work input to make them available at the point of conversion to useful thermal energy. Energy densities for wind across the typical operating range for turbines are presented in Table 1 below (parameters associated with solar and wave energy sources are also summarised in the table). For solar radiation, the spatial dimension used for calculating energy density is area i.e. the parameter of interest is the solar energy available per unit of irradiated area. For ocean wave energy, the spatial dimension associated with energy density is length, specifically the horizontal distance along the ocean surface perpendicular to the direction of wave travel, or parallel to the actual wave front. Table 1: Energy density and its meaning for flow-based renewable energy sources. Sources for economic wind speed and solar and wave energy densities: Energy in Australia 2012, p. 10, Map 1. While it’s not particularly meaningful to make direct quantitative comparisons on the basis of energy density between fossil sources and flow-based renewable sources, there are ways of approaching this task indirectly that can be useful for better appreciating the very diffuse nature of renewable energy sources relative to their incumbent counterparts. The approach that I’ll take here is to look at the infrastructure scales associated with meeting a given energy supply task from conventional sources and from renewables. This won’t be an exhaustive exercise in cataloguing and describing the entire infrastructure involved; rather, for each source that we look at I’ll select some of the key elements necessary for its production, supply and conversion to final energy services, and describe each element in terms of characteristic parameters that give a sense of its overall scale. The intention is that the scale parameters will then act as a proxy for the energy density of each source—on the basis that the higher a given source’s energy density, the more compact is the infrastructure associated with it. In other words, the general approach is to use some characteristic quantities to enable a better qualitative appreciation of the energy density associated with different sources. The first step in this process is to select an energy supply task on which to base the comparison. I’ll be looking at energy use in Australia, based on a one-year period from mid-2008 to mid-2009. The principal reason for focusing on Australia is that I have comprehensive data immediately at hand, and with which I’m reasonably familiar already. Being accustomed to working in the Australian institutional context, I also have a good idea about where to go to fill in any gaps. So this is partly a matter of convenience, but it’s also a good case study in its own right, given the high quality of renewable energy resources in Australia. The Australian context should paint renewable sources in their best possible light—most other locations of a comparable spatial extent (7.692 million square kilometres, 5 percent of the Earth’s land area) are likely to be less favourable in terms of infrastructure scale for a given supply task. I’ve selected that particular period of time as it falls just prior to a significant increase in overall installed capacity for solar photovoltaic (PV) electricity generation. This rapid increase combined with delays in metering skewed the data for assessing the overall PV capacity factor (annual average electricity production rate divided by nominal installed production capacity) for the subsequent and most recent reporting period. The PV capacity factor can be used to correlate nominal infrastructure capacity with actual supply under actual national economy-scale operating conditions, and so is a very useful parameter for assessing overall infrastructure scale to meet the given supply task from solar PV. In order to present the most realistic picture of solar PV, it’s desirable to look at conditions closer to steady-state in terms of changes to installed capacity. The focus on a given period of time is very important: it allows overall energy use to be converted to an average rate of energy use, or the effective power associated with the supply task. This is the key to comparing stock-based and flow-based energy sources—by considering a specific time period, changes in the stock level (for example, production of some part of the proved reserve) for a given fossil energy source can be expressed as an average rate of production or use—in other words, the stock change is expressed as a flow. The infrastructure required to provide the same average final energy service flow rate from different sources can then be compared on an equivalent basis. I’ll be dealing with a lot of numerical data here. To make the job of both presenting and interpreting this a little simpler, all source data and calculated figures have been rounded, with context determining number of significant figures. Rather than providing references exhaustively in the text, a spreadsheet with all source data and calculations, and including linked references, is available here. As for the energy supply task itself, some explanatory comments on this will help with matching the figures presented here with those in the primary data source, Energy in Australia 2011. Firstly, the energy supply task that we’ll look at here is slightly smaller than the overall supply task for Australia in 2008-2009, being only that component provided from coal, crude oil and natural gas i.e. excluding renewable sources. This is because the purpose of the exercise is to look at the equivalent renewable infrastructure required to replicate the existing energy supply from fossil sources. Secondly, in order to simplify the overall situation that we’ll consider, I’ve included only coal used for electricity generation i.e. excluding approximately 10 percent of overall supply that is used for heating. I’ve also assumed that all refined fuel from crude oil is used directly for transport—the actual proportion used for this purpose is around 70 to 75 percent. The overall result of the simplifications is that the energy supply task from fossil sources that we’ll use as the basis for the renewable supply task accounts for around 92 percent of Australia’s total primary energy supply in 2008-2009. One further note in relation to this though: in the primary data source on which this is based, the annual Energy in Australia publications, there are sometimes discrepancies in figures between the edition in which the most recent year’s data is first published, and the historical presentation of that same year’s data in subsequent editions. For example, the data for 2008-2009 was first published in Energy in Australia 2011, where total energy use is given as 5,773 PJ (p.14); in the subsequent edition, Energy in Australia 2012, total energy use in 2008-09 is given as 5,879 PJ (Table 5 on p.23). The difference is presumably due to update of figures that were previously incomplete or based on estimates at the time of first publication. The general approach I’ve adopted here is to base all data on figures provided on initial publication, recognising that some of these may be subject to subsequent revision. 5a. All electricity for final energy services generated by wind turbines. 5b. All electricity for final energy services generated by solar PV panels. It bears emphasising here that the point of this exercise is not to present detailed, realistic plans for meeting all of Australia’s energy supply needs from renewably generated electricity. The exercise is specifically aimed at enabling a clearer appreciation of the relative energy density of fossil and renewable energy sources, by sketching out a rough picture of the infrastructure implications associated with each supply route. The exercise does not deal with important questions such as the intermittency of wind and solar radiation, and matching intermittent supply with conventional demand patterns. 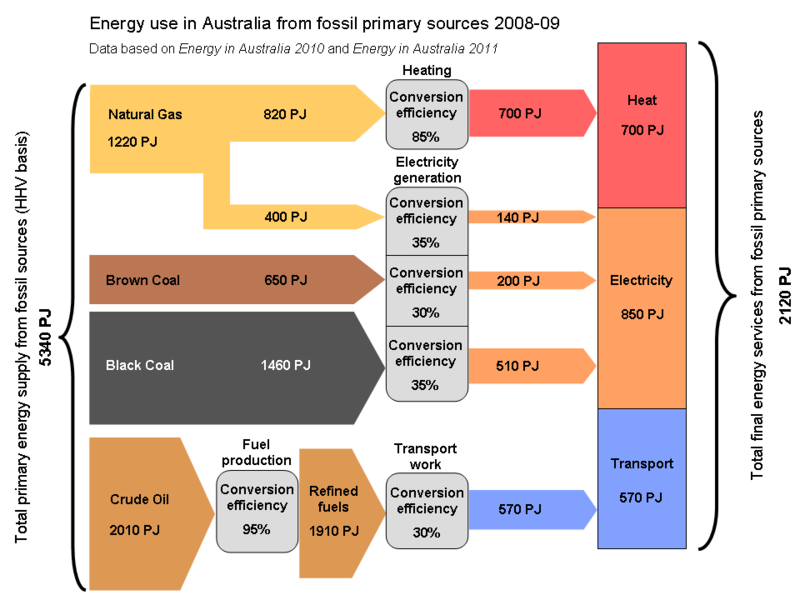 The simplified (and slightly reduced) version of Australia’s primary energy supply from fossil sources for the one-year period from mid-2008 to mid-2009 is presented in figure 1. The total primary energy from natural gas, brown coal, black coal and crude oil is 5,340 PJ (petajoules; 1015 joules). This is around 96 percent of Australia’s total primary energy supply from fossil sources, and around 92 precent of total primary energy supply. All primary energy supply figures are based on higher heating value—“gross energy content”—of sources. All data except heating and transport work conversion efficiencies adapted from Energy in Australia 2010 and Energy in Australia 2011. Click on image for larger view. all crude oil is processed to refined fuels, and all refined fuels are used to provide transport work via internal combustion engines (spark-ignition, diesel cycle and jet-propulsion cycle). The overall energy supply task through to final energy services is shown in figure 1. The total final energy services—heat, electricity and transport work—amount to 2,120 PJ, for an economy-wide average conversion efficiency from primary sources to final services of 40 percent. Electricity generation: efficiency for each fuel type is based on aggregate production figures for Australia over a one-year period i.e. aggregated electrical energy leaving generation plants, divided by aggregate fuel use. Fuel production: refined fuels produced in Australia, divided by total crude oil and other refinery feedstock input. Transport work: weighted average (based on proportion of overall transport fuel use) of typical thermal efficiencies for spark-ignition (Otto cycle), Diesel cycle and jet-propulsion cycle internal combustion engines. The thermal efficiencies are for full operating cycles i.e. driving-cycle basis for road transport, overall flight-cycle for aviation. This takes into account variation in efficiency under the full range of real-world operating conditions. Note that total crude oil energy use is determined from total refined fuel energy use, on the basis that a significant proportion of overall refined fuels is imported directly (around 36 percent). Crude oil use shown in figure 1 is substantially higher than actual direct Australian crude oil energy use in 2008-2009, as it includes the feedstock for production of the imported refined fuels. In order to match the energy supply task from fossil sources shown in figure 1 from renewable energy sources, we’ll assume that all final energy services are provided via electricity. In other words, sufficient electricity supply capacity will be required to meet the existing 850 PJ electricity use, plus the existing 700 PJ heating task, plus the 570 PJ transport work task. In order to establish an overall basis for the equivalent renewably-generated electricity supply task, appropriate allowances for the heating and transport tasks are required i.e. we need to take into account conversion efficiencies between electrical energy input and heating output, and between electrical energy input and transport work output. The relationship between overall final energy services and equivalent electricity supply from renewable sources is shown in figure 2. In order to establish the electricity required to meet the heating task, I’ve assumed that 25 percent of the heating task will be met using heat pumps (refrigerators and residential air conditioners are heat pumps; heat pumps can be used for both cooling and heating). The figure of 25 percent is a very rough approximation to the proportion of existing natural gas use for commercial and residential space and water heating. I’ve assumed a coefficient of performance (COP) for the heating task carried out via heat pumps of 3, which seems reasonable to me for an economy-wide average under a wide range or real operating conditions. I’ve assumed that the remaining 75 percent of the heating task will be met via inductive and resistive devices with average efficiency of 90 percent. This covers applications such as gas ovens and stoves. The electricity required for transport work is based on two major assumptions: i) in the absence of practical expectation that air transport will ever be electrically powered, the bulk of air transport is replaced with land transport; and ii) an economy-wide overall generator-to-wheels efficiency for transport of 70 percent. This simply means that of the electricity used for transport purposes, 70 percent of electricity supplied to the transmission and distribution system is eventually converted to transport work i.e. driving the wheels of transport vehicles. This takes into account all losses associated with transmission, distribution, charging of on-board batteries and powering of drive trains. The overall result of these conversion allowances is that the total electrical energy supply from renewable sources required to meet the existing final energy services task of 2,120 PJ is around 2,300 PJ. In other words, the renewable electricity generation infrastructure to replace Australia’s energy supply from fossil sources in 2008-2009 must be capable of supplying 2,300 PJ of electrical energy over a one-year period. 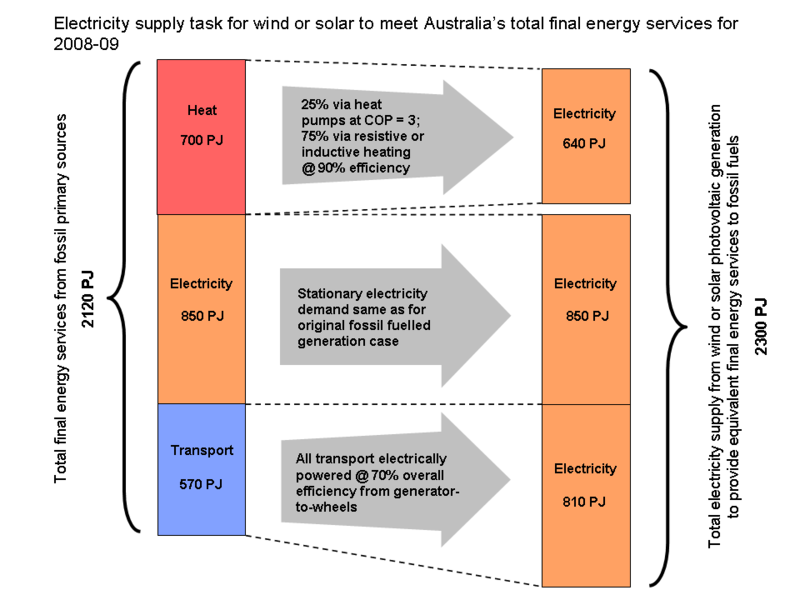 Figure 2: Electricity supply task from renewable sources to meet Australia’s final energy services supply task for 2008-09. Click on image for larger view. I’ll look at each of the major fossil energy sources independently here. Just to be clear, I stress once again that my intention is not to provide a comprehensive account of the infrastructure associated with each energy source. Developing such an account, and using it to estimate aggregate physical quantities and financial cost associated with the infrastructure, would enable an even better illustration of comparative energy density for fossil and renewable energy sources than the one I provide here. This task is beyond the scope that Beyond this Brief Anomaly can handle at present. It could be pursued later though, as an extension to this work; if a reader is interested in taking up the task based on the foundations set out here, I’d be very pleased to consider publishing the findings as a guest post. The spreadsheet with the post’s source data and calculations would provide a solid starting point for that task. So with this in mind, the purpose of the discussion here is to provide a basis for visualising—and hence better appreciating—what the energy use figures mean in more concrete terms, by connecting them with the physical infrastructure required to supply that energy from different sources. Roughly 90 percent of Australia’s natural gas production is from conventional sources associated with petroleum reservoirs; the remainder is coal seam gas (CSG). The difference in the proportion of overall production from each source is reflected to a significant degree in the scale of infrastructure required. Per unit of production, conventional gas requires a smaller number of wells at higher rates relative to coal seam gas. Some specific figures will help to illustrate this. In 2008-09, around 21 percent of Australia’s total natural gas production (1710 PJ including exports) was from Gippsland Basin. The Gippsland Basin is located in Bass Strait off the south coast of the state of Victoria; oil and gas from the basin is all produced by off-shore platforms. In 2008-09, a total of 21 platforms were operating there, with an average annual production per platform of 17 PJ, or an effective continuous production rate of 550 MW on a higher heating value basis. By contrast, at the end of 2011, according to industry data a total of 2071 CSG production wells were in operation in Australia—the majority in Queensland and the remainder in New South Wales. For the 2010-11 year, total CSG production in Australia was 240 PJ, corresponding with annual production per well of just 0.12 PJ, or an average effective production rate of 4 MW. This is in close agreement with industry figures for average production rate over the 20 year lifespan of a typical well, which translates to around 3 MW per well. The CSG industry claims that an average well supplies gas with associated energy 5 times greater than the electricity output of a 5 MW wind turbine. We’ll look more closely at this claim when we compare fossil and renewable infrastructure in section 6. It’s immediately apparent from this that the effective energy density of natural gas across the full production and supply chain on a lifecycle basis is likely to be highly dependent on the relative proportion of production from conventional and non-conventional sources. The two orders of magnitude lower production rate per well for CSG is likely to translate to significantly higher overall infrastructure requirements than for conventional gas, though there’s also likely to be a significant infrastructure saving for land-based versus off-shore production. With Australia’s large land area and widely dispersed population centres, transmission and distribution pipelines are a substantial part of the overall natural gas infrastructure. Australia has 20,000 kilometres of transmission and 82,000 kilometres of distribution pipelines. The overall scale of this part of the infrastructure is dominated not by the actual quantity of gas used, but by the distances over which it must be transported. To illustrate this—and as a very effective proxy for the energy density associated with natural gas—we can look at the size of the pipes that would be required to transport Australia’s entire natural gas supply over long distances. Transmission line pressures are higher than those used for distribution networks, which in turn are much higher than for the supply lines to residential and commercial properties (gas is typically supplied to industrial sites at significantly higher pressures than in these situations). As a result of the higher pressure, gas density is higher and the pipes to transport the gas are therefore smaller per unit of energy delivered than for distribution and final supply. Transmission pressures range from 15,000 kilopascals down to around 1,150 kilopascals. Acceptable pipe velocities for long distance gas transmission range from around 7 metres per second to around 20 metres per second. It turns out that the entire Australian domestic natural gas supply task of 1220 PJ could be transmitted in a single pipe ranging in internal diameter from 1100 mm at maximum pressure and minimum velocity, to 2400 mm at minimum pressure and maximum velocity. I’m not suggesting here that we would ever actually supply natural gas via a single transmission line at that size—the point of this is just to show that the relatively high energy density of compressed natural gas translates to relatively compact infrastructure requirements. The largest diameter gas pipeline operating in Australia at present is around 1100 mm; 2400 mm would be an extremely large pipe—nonetheless, it is technically feasible to construct and operate pipelines at that size; at the pressures we’re considering here though, a number of smaller diameter pipes would be run in parallel. Almost all of Australia’s brown coal is produced from 3 mines in Victoria’s Latrobe Valley, to the east of Melbourne (a small quantity is produced in South Australia at Leigh Creek). The low energy density of brown coal means that a quantity more than twice that of black coal is required for an equivalent electricity supply task. Even so, the 65 Mt of brown coal for our overall energy supply task could be transported by a single, large belt conveyor. The world’s largest belt conveyor has a capacity of 40,000 T/h, with a belt width of 3,200 mm (and incidentally, is also used to transport brown coal). A single conveyor with a belt 2000 mm wide, running at a speed of 5 metres per second and at 80 percent of its maximum capacity could easily transport 7,400 T/h of coal between an open cut mine and an adjacent power station. The bucket-wheel dredgers (or excavators) used to mine brown coal in the Latrobe Valley each have a capacity of around 60,000 T/day. Three of these dredgers operating continuously are capable of meeting Australia’s brown coal supply task, although in practice more are required to remove overburden (soil and clay above the coal seam) and to allow for maintenance. The dredgers also require support from bulldozers (including Caterpillar D-11s, amongst the largest available) and fleets of maintenance and other support vehicles. The largest dredgers are around 200 metres in length and equivalent in height to a 12 story building. The total length of working faces for the three open cut mines in the Latrobe Valley is roughly 5 kilometres. The coal seam ranges in depth from 60 to 140 metres; we’ll take 100 metres as a typical depth. On this basis the annual expansion of each mine perpendicular to the working face is around 150 metres. The annual land area consumed by the open cuts is therefore around 75 hectares, or 0.75 square kilometers. In the almost 90 years since brown coal fired electricity generation commenced in the Latrobe Valley in 1924, the total land area mined is in the order of 50 square kilometers. With it’s much higher energy density, the volume of black coal required for the overall supply task is almost identical to that for brown coal, and the total mass is actually slightly less, while providing more than two-and-a-half times more electricity. The bulk of black coal supply for electricity generation in Australia is produced from around 16 mines, most of which are open cuts. Total annual mine area expansion will be of a similar order to that of brown coal mines. Black coal is typically mined using dragline excavators to remove overburden, with loaders and trucks used to transfer the coal to conveyors for transport directly to power stations, or to rail heads for loading onto trains where the power stations are a significant distance from the mine. Large mines will typically have multiple dragline excavators, including redundant capacity to allow for maintenance, as well as extensive fleets of loaders, trucks and related support equipment. Conveyor capacity to transport black coal will be on the same scale as for brown coal, although in practice more conveyors are required due to the greater number of mines. One significant difference between brown coal and black coal is in the use of trains to transport significant quantities of fuel by rail. Around 6 mines and power stations are linked by rail, but to get some sense of the scale of this, let’s consider what would be required to transport all of the black coal for electricity generation by rail. The company Pacific National is the second largest coal haulage operator in Austraila, transporting in the order of 90 million tonnes of coal per year, using 36 trains averaging 5,700 tonnes capacity. Our black coal supply task of 63 million tonnes per year amounts to around 70 percent of this one company’s capacity; this is 310 round trips per train per year for each of the company’s 36 trains, assuming average capacity for each train. The actual black coal rail haulage task for our case study is something in the order of one third of this, and so very comfortably within the capacity of this single—albeit large—operator. At a typical economic pipe velocity of 3 metres per second, the total crude oil supply for Australia’s 2008-09 refined fuels could be delivered via a single pipe with internal diameter of less than 850 mm operating on a continuous basis. Daily crude oil consumption is equivalent in volume to 60 Olympic-size swimming pools. While more than half of Australia’s crude oil is still produced domestically, if the full 46 million tonnes was imported by ship, for an average tanker capacity of 120 million litres (ship size approximately 90,000 dead weight tonnes), around 450 deliveries would be required. Australia has 7 refineries, and so the 450 deliveries equates to around 65 per refinery, or one every 6 or so days. More than 25 percent of Australia’s refined fuel is imported, which is more than the combined capacity of Australia’s two largest refineries. On this basis, around 10 refineries would be required to meet the total refined fuel supply task, reducing annual crude oil deliveries per refinery to 45, or one every 8 days. While the total crude oil supply could in principle be delivered via a single 850 mm pipe, this serves only as a proxy for visualising the energy density of the fuel after its production and delivery: even if it were processed in a single refinery (each of the world’s two largest refineries do in fact process more than Australia’s total equivalent crude oil supply each year), that refinery’s feedstock comprises the aggregate production of many wells. The globally integrated nature of the oil industry means that these wells could in principle be located across a significant proportion of the Earth’s land and off-shore sea area. In practice, the bulk of Austraila’s petroleum imports (crude oil and refined fuels) are, in order of total volume, drawn from Vietnam, Malaysia, Indonesia, United Arab Emirates and New Zealand. With the exception of UAE (principally Abu Dhabi), in global terms, these, like Australia, are all relatively small producers. Of these, UAE is the only one within the seventeen countries that in 2011 produced crude oil at over 1 million barrels per day. In order to connect Australia’s crude oil consumption to the global context, I’ll use data from those top seventeen countries to characterise the overall supply task in terms of the number of wells required (this data is presented in Table 6 below). The spread of oil well production rates is immediately apparent from the Table 6 data: from an average 3100 barrels per well per day for Saudi Arabia (214 MW per well higher heating value equivalent) down to an average 15 barrels per well per day for the USA (around 1 MW per well). These national average figures will also likely mask roughly commensurate variation within each country. Globally, most oil is produced from a small number of very large fields, with a long tail of smaller fields making up the balance of production. Within a given country (where the country is sufficiently large that overall production is from multiple fields), a large proportion of total production is accounted for by a relatively small number of wells, with a long tail of smaller wells accounting for the remainder. On this basis, the number of wells required meet Australia’s crude oil supply task depends on where the oil is produced. Were Australia to produce all of its oil domestically, around 3,500 average size Australian wells (at 18 MW per well) would be required; if Australia imported all of its oil from UAE, around 500 wells of average size (135 MW per well) for that country would be required. To place this in the global context though, we can consider the number of world weighted average wells (88 barrels per well per day; 6 MW per well) required for Australia’s supply. This comes in at very roughly 11,000 wells. This figure is particularly worth keeping in mind for when we compare fossil energy supply infrastructure with its equivalent renewable energy infrastructure. Just to put the variation in intra-country well production rates in context, we can look again at the Gippsland Basin off the coast of Victoria. The 21 oil and gas production platforms operating there produce crude oil and condensate (i.e. total liquids used as refinery feedstock) at an annual average rate per platform of around 3,800 barrels per day, an effective production rate of around 260 MW (while a platform can produce oil and gas from multiple wells, this will still provide a reasonable rough guide to the average per well). This is more than 14 times the Australian average rate per well. For reference, the 21 Gippsland Basin platforms produced around 17 percent of Australia’s combined crude oil and condensate by overall volume in 2008-09, compared with a total of around 1,300 wells for Australia’s total domestic production. From this it’s clear that basing infrastructure scale estimates on average well size introduces a significant bias in the picture that emerges. The actual infrastructure is significantly more geographically concentrated than this suggests. An estimate of the land area required for crude oil transfer, storage and refining will also provide a handy proxy for energy density. The land area occupied by the Jamnagar Refinery in Gujarat, India—the world’s largest—is roughly 30 square kilometers or 3000 hectares, including port facilities, allied services and accommodation for employees; its capacity, at 1.24 million barrels of crude oil per day, is around 33 percent greater than Australia’s equivalent crude oil use. Using this as a scaling basis, we could very roughly estimate that the total land area required for Australia’s fuel refining is in the order of 25 square kilometers (2,500 hectares). Averaged across all fuels, the 850 PJ electricity included in the supply task requires 42 GW installed capacity, the majority of which is provided by 67 plants of greater than 100 MW rated capacity. These plants operate around 230 turbines with an average turbine capacity of 185 MW. The actual turbines range in capacity from 25 MW up to 750 MW. In 2008-09, the capacity factor for all wind generated electricity in Australia was around 26 percent. For the purpose of this exercise, we’ll assume a more generous capacity factor of 30 percent i.e. a higher capacity factor will make wind generation look more favourable in terms of the overall infrastructure requirement, and also builds into our calculations some allowance for future performance improvements in overall electricity supply from wind. The capacity factor is determined by dividing the actual wind-generated electricity over the one-year period by the theoretical electricity output that would be achieved if all turbines operated continuously at their rated capacity. This allows us to correlate between rated capacity and actual output under real-world operating conditions, taking into account intermittency in wind speed, and issues such as poor (and better-than-anticipated) siting. This is an economy (and continent) spanning capacity factor, and so gives the most realistic picture of wind turbine performance in practice. As the basis for estimating wind infrastructure scale, I’ve used the largest currently available turbine, the Enercon E-126, with a nominal rated capacity of 7.5 MW. At the time of writing a total of only around 150 are in operation or under construction, mainly in Europe, and none are operating in or planned for Australia. I selected this turbine as the sizing basis on the grounds that the overall infrastructure scale per unit of electrical energy output is likely to decrease with turbine size. This will certainly minimise the overall number of turbines required, and hence reduces the extent of support infrastructure such as access roads for maintenance, and is also likely to reduce cable length for connection to electricity transmission infrastructure. We won’t actually attempt to quantify the scale of this ancillary infrastructure here, but again, I’m setting out to present the renewable infrastructure in its best possible light. As a result of the estimation basis used here, the total infrastructure figures can be considered as the extreme lower bound that might presently be achieved. The Enercon E-126 turbine has a rotor diameter of 126 metres; the rotor hub height is 135 metres above ground level. Maximum height to the rotor tip is 198 metres. At its base, the tower has a diameter of 14.5 metres, and a footprint, excluding foundations, of 165 square metres. The tower tapers to 4.1 metres diameter at the hub. The total mass of each turbine is over 6,000 tonnes. Of this, over 85 percent is the foundation (2,500 T) and the tower (2,800 T). The machine components, including the rotor, make up the remainder, at over 700 tonnes. Based on the 30 percent capacity factor, the annual electricity supply task translates to a total installed wind turbine capacity of 243 GW. Meeting this capacity requires a total of 32,400 turbines; the total swept area of the blades for these turbines is over 400 square kilometers. The total mass of turbines including towers and foundations is 195 million tonnes; of this, the machine components account for 23 million tonnes. The total length of the towers laid end-to-end is a little under 4,400 kilometres. Total land area occupied by the tower footprints, excluding foundations, is over 5 square kilometers. Based on a turbine spacing of 10 rotor diameters, the total land envelope occupied by the turbines would be well over 40,000 square kilometers (4 million hectares), or a little under 0.6 percent of Australia’s total land area. Based on current and proposed wind farm projects for Australia, the average infrastructure cost is around AUD$2.7 million per installed megawatt. On this basis, the total infrastructure investment cost for meeting the annual electricity supply task from wind turbines would be in the order of AUD$650 billion, or very roughly 50 percent of Australia’s annual GDP. Method iii. : Distribute generating capacity across capital cities, proportional to population. Infrastructure sizing will be based on PV cells with the highest commercially-available efficiency of 21.6 percent. There are good financial efficiency arguments for using cells with lower energy conversion efficiency in Australia, due to high insolation rates i.e. it’s likely to be more cost effective to use a greater number of lower efficiency but less expensive panels. Given that the purpose of this exercise is to get a handle on energy density in infrastructure terms, I’ll ignore this and go with the higher energy efficiency, again to present the best possible case for solar PV. For the purpose of working out overall panel area, number of panels, and total panel mass, I’ll use a different panel for which I have ready access to the manufacturer’s data, the Kyocera Solar Module KD240GH-2PB. The high cell efficiency above (21.6 percent) will be down rated to an actual panel area efficiency using the Kyocera factor of just under 89 percent i.e. the panel efficiency we’ll use is around 19.2 percent i.e. 19.2 percent of solar energy irradiating the panel area is converted to electrical energy. The Kyocera panels are high quality, robust units that are used extensively in Australia. Using the Kyocera rated cell efficiency of 16.44 percent, instead of the maximum commercially available figure of 21.6 percent, the number, total area and mass of panels would all increase by around 31 percent. This takes into account only one component in the overall electricity supply system. A comprehensive approach would need to consider equipment local to the panels such as inverters and (not insignificantly) support structures; on top of this, additional switch gear and transformers, and changes to transmission and distribution systems would need to be taken into account. The capacity factor for solar PV generated electricity in Australia in 2008-09 was around 18 percent. For present purposes, we’ll use 20 percent. The solar PV capacity factor is calculated in the same way as the wind turbine capacity factor, and assuming a generous value has a similar effect, for similar reasons. Table 8: solar PV infrastructure scale indicators, assuming distribution of generating capacity is same as distribution of currently installed capacity, with same overall quality of siting. Table 9: solar PV infrastructure scale indicators, assuming all generating capacity ideally sited at locations with insolation equivalent to Alice Springs. Table 10: solar PV infrastructure scale indicators, with generating capacity distributed across capital cities, proportional to population. Comparing the three methods for estimating solar PV infrastructure size suggests that optimised siting, either in terms of locating the panels closest to the highest insolation (Alice Springs), or by siting panels closest to the point of use for electricity, potentially has significant benefits. These figures would need to be adjusted for changes to transmission losses for each case—this would be reflected in the size of the electricity supply task. In the case of the Alice Springs siting, we could expect the supply task to increase somewhat; in the case of the population distribution, we could expect it to decrease. Either way, comparison with method i suggests that the historical capacity factor approach delivers sufficiently accurate results for our purposes, particularly when variation in average panel efficiency is taken into account—i.e. the best case for the lower efficiency panels is better than the worst case for the higher efficiency panels. On this basis, it doesn’t seem unreasonable to take method i as the benchmark for infrastructure scale. Just to put the figures for total PV panel area of somewhere in the region of 1,400 to 2,500 square kilometres in context, in the state of Victoria in which I live, the total surface area for paved municipal roads is in the order of 400 square kilometres (54,000 kilometres by two lanes around 3.5 metres wide). The panel area per household (170 to 300 square metres) is greater than the available roof space of all homes in Australia—even without taking into account siting considerations, such as pitched roof sections facing away from the sun. In comparing the wind turbine renewable supply scenario with the solar PV scenario, there are some striking similarities as well as important differences. Firstly, there’s significant similarity between installed capacity for wind (243 GW) and installed capacity for solar PV (270-370 GW, depending on configuration). It’s noteworthy that the total turbine swept area (400 square kilometres) is within an order of magnitude of the total PV panel area (1,400-2,500 square kilometres). Financial cost for solar PV (AU$100-180 billion) appears to be on a par with the wind cost (AU$650 billion), considering that the solar PV figure covers only the wholesale cost of panels, whereas the wind figure is total project cost. Also of note is the similarity between the total mass of machine components for wind turbines (23 million tonnes) and total mass for PV panels (18-32 million tonnes). Where solar PV and wind diverge significantly is in the total land area required for each. While the actual footprint area for wind is only 5 square kilometres, versus 1,400 to 2,500 square kilometres for solar PV (although the latter area reduces when the panel incline angle is taken into account), in principle the solar generating capacity could be located within an overall land envelope of the same size i.e. a square 50 kilometres on each side. Wind, on the other hand, requires a total land area envelope for all wind farm sites that is up to 29 times as large (40,000 square kilometres versus 1,400 square kilometres). The implications of this for infrastructure scale as a proxy for effective energy density are not insignificant, as the wider distribution of turbines increases both financial and energetic costs of installation and maintenance. In a similar vein, while the mass of turbine machine components is similar in magnitude to the total mass of panels, the structures required to locate those machine components 135 metres above ground level have (literally) enormous implications for overall infrastructure scale, and material and energetic requirements associated with its production and installation. On balance, it appears that the overall infrastructure scale associated with the wind turbine scenario may be significantly greater than for solar PV, perhaps by as much as several hundred percent—though establishing this with confidence would require much more comprehensive assessment than that carried out here. Land area provides a particularly useful proxy for visualising the difference in energy density associated with fossil and renewable sources. We’ve probably accumulated enough data at this point to at least make an order of magnitude comparison here. On the fossil fuel side, I’ll include total coal mine area, say something in the order of 100 square kilometres (on the order of twice the total area of Victoria’s 3 brown coal open cuts after 90 years production). To this I’ll add a very generous allowance of 1000 square metres (compare this with 165 square meters for the footprint of the Enercon E-126 wind turbine tower) for each of the 11,000 world weighted average oil wells required for Australia’s crude oil—i.e. 11 square kilometres. For good measure, I’ll add in the same again for gas production wells—another 11 square kilometres. Let’s add in the 25 square kilometres for oil refineries and port facilities; and allow an average of 1 square kilometre for each of Australia’s 67 power stations over 100 MW capacity—another 67 square kilometres. That brings us up to a total of 214 square kilometres; let’s call it 250 square kilometres for good measure—keeping in mind that this figure is very conservative i.e. it depicts fossil fuels in a far less favourable light with respect to energy density than is actually the case. We can compare this with the two characteristic area parameters for wind turbines: the swept blade area of 400 square kilometres; and the overall land envelope for all wind farms, at 10 rotor diameter spacing between each turbine of over 40,000 square kilometres. The relationship between these two figures tells an important story: the first figure sheds some light on the energy density associated with wind; the second tells us something about the amount of energy associated with moving air masses that we can actually make available in forms useful to us (i.e. mechanical work, or electrical energy). We can’t simply tap the entire moving air mass; we have to dip into it sparingly in order to avoid disturbing it to such an extent that it stops cooperating. We’re starting to touch here on what will become a major line of inquiry in forthcoming posts, under the overarching theme of efficiency—the difference between the gross energy associated with a source, and the amount of this energy that we can channel towards our own desired ends. In considering these figures for wind, keep in mind also that the estimation basis was intentionally biased in favour of minimising these figures for wind. Turning to solar PV, the obvious characteristic area parameter to look at is the total panel area: something between 1400 and 2500 square kilometres (though in practice, it’s likely to be closer to the high end of that range). Again, keep in mind that the estimation basis favours minimising the figures. The overall result of this is that using occupied land area as a proxy for energy density, we probably have something like a factor of between 10 (solar PV) and 100 (wind turbines) difference between the overall fossil fuel task, and the renewable electricity task i.e. a factor of 1 to 2 orders of magnitude difference. There are other approaches that we can take to making this comparison also. For instance, we can compare the infrastructure scale for oil and gas wells with that for wind turbines. The jacket for the new Marlin B platform, part of the Kipper Tuna Turrum off-shore oil and gas production development by ExxonMobil in the Gippsland Basin, was launched and secured to the sea floor at its site in Bass Strait during 2011. At 4,700 tonnes, it is an enormous structure—I can attest to this personally, having watched it being towed past Phillip Island in January 2011. Based on the figures we looked at earlier, let’s assume that the effective oil and gas production rate from Marlin B is in the order of 500 MW. Let’s also assume that the final mass of the platform fully assembled is 4 times that of the jacket (the structure fixed to the seafloor, and that supports the production plant and equipment). This would make it around 19,000 tonnes. We can use this as a rough basis for estimating the total mass of production equipment associated with all oil wells for Australia’s total consumption. The 21 (soon to be 23) platforms operating in the Gippsland Basin produce 17 percent of domestic crude oil and condensate. For the sake of this exercise, let’s call it 10 percent of all crude oil, bearing in mind the proportion of Australia’s refined fuels that comes from oil produced elsewhere. On this basis, assume that the total mass of oil production equipment required for Australia’s 2,010 PJ annual oil use is 10 times the mass of the Gippsland Basin platforms; and let’s assume that the total mass for these 23 platforms is simply 23 times the Marlin B educated guess of 19,000 tonnes. This puts the total at around 4.4 million tonnes. Now let’s compare this with the mass of wind turbine infrastructure required for the same task. The total wind turbine mass for the overall electricity supply task is 195 million tonnes. We’re interested specifically in the proportion of this supplying electricity for transport though, or 810 PJ of 2,300 PJ total. That makes the mass of equivalent wind turbine infrastructure around 69 million tonnes. That’s a factor of 16 greater than the total mass of production infrastructure for oil. Considering now the solar PV option, the mass of panels alone required to supply electricity for transport i.e. to replace crude oil is around 8 million tonnes—almost double the guestimated 4.4 million tonnes of oil production infrastructure. This is based on very rough estimates only, but it’s noteworthy that the exercise comes out once again so firmly in favour of fossil fuels, to the extent that infrastructure scale stands as a useful proxy for energy density. I’ll wrap up by looking at one more area of comparison: world average weighted oil wells (8 MW effective production rate on a higher heating value basis) versus wind turbines; and coal seam gas wells versus wind turbines. It’s particularly noteworthy that the effective production rate of 8 MW is so close to the rated capacity of the Enercon E-126 wind turbine at 7.5 MW. We could mount a case that while the energy associated with produced oil, or even an individual oil well, is far more concentrated than that associated with wind, when we take into account the far more widely dispersed distribution of oil within geological formations in the Earth’s crust, the picture changes somewhat. That is, a significant amount of infrastructure is required—and a significant amount of work must be done—to accumulate crude oil-based refined fuels at their points of final use from widely dispersed crude oil source media. So let’s look at the relative figures for oil and wind on that basis. Australia’s oil supply task requires 11,000 world weighted average (8 MW) wells; the overall conversion efficiency for oil produced from these wells once landed in Australia, when used for transport, is around 95 % x 30 %, or around 29 percent. So the output per well translates to around 2.3 MW transport work. For wind, 11,400 turbines support the transport task; at 30 % capacity factor x 70 % generator-to-wheels efficiency, the overall output per turbine is 21 percent of rated capacity or 1.6 MW. This still places crude oil production at a 43 percent advantage over wind on a per-primary-energy-source-interface-point basis, even when using the highly conservative world weighted average well production rate. Some of this advantage will be eroded by production and transport costs prior to the crude oil (or refined fuels) landing in Australia, but the differences is likely to be relatively minor, particularly when we consider also that wind turbines have their own life-cycle operating cost in energy terms. The final comparison I’ll consider is that of wind turbines and coal seam gas (CSG) wells. Recall the CSG industry claim referred to earlier that a single well at 3 MW effective production rate over a 20 year lifetime produces gas with associated energy 5 times greater than the electricity output of a 5 MW wind turbine. How does this claim hold up? Using a wind turbine capacity factor of 26 percent (the actual factor for 2008-09, in place of our more generous figure of 30 percent), the total electricity production over 20 years is 820 TJ. The energy associated with gas production on a higher heating value basis is 1,890 TJ, or a little over 2 times the electricity produced by the turbine—certainly not the CSG industry’s claimed factor of 5. Further to this though, we really need to be comparing not only gross energy output, but energy output on the basis of equivalent energy form i.e. a much more meaningful comparison would involve converting the gas output to electricity, using the average gas to electricity conversion efficiency of 35 percent (see Figure 1). On this basis, the equivalent electricity output from the CSG well falls to 660 TJ, or around 80 percent of the wind turbine’s output. The CSG industry’s claims are at this point looking somewhat misleading. For our purposes here though, the important insight to take from this is that there does in fact appear to be a cross-over point at which the effective energy density of renewable energy sources surpasses on some measures that of fossil fuels. Coal seam gas looks like it may be much less favourable on an effective energy density basis than conventional fossil fuels, a suggestion at which I hinted in the previous post. This supports the observation that the effective energy density of fossil fuels is reducing as conventional resources are depleted. We might well ask on this basis whether unconventional fossil energy sources such as CSG have a reasonable prospect of replacing conventional fossil energy sources—in the same way that we’re asking here about the prospects for renewable energy sources to replace fossil energy sources more generally. In closing, the very large scale of the infrastructure supply and maintenance task associated with meeting all of Australia’s final energy services from renewable sources provides some pause for thought. In 2010, total new wind installations worldwide amounted to around 33 GW capacity. In the same year, growth in solar PV installed capacity was around 12 GW. These are sobering figures when contemplating the prospects for rolling out 243 GW of wind capacity, or between 270 and 370 GW of solar PV capacity, in a single country! Given the extended timeframe over which such a transition would—if at all feasible—take place, it seems pretty clear that it would not be a matter of installing the infrastructure and then sitting back to reap the benefits. There would be an ongoing need to replace some proportion of the installed equipment on a continuously rolling basis. This leads me to the following observation: whereas meeting the final energy service task from fossil sources requires that a continuous input flow of fossil fuels be maintained, meeting the final energy service task from renewable sources requires that a continuous input flow of wind turbines and solar PV panels be maintained. And at present, all of our wind turbine and solar PV manufacturing is inherently subsidised by our fossil energy sources, simply by virtue of the fact that the infrastructure itself is a product of an industrial economy that is predominantly fossil-fueled, and enabled by the very special properties of fossil energy sources. This entry was posted in Energy source comparison and tagged coal seam gas, energy density, fossil fuels, infrastructure scale, renewable energy, solar PV, wind turbine by Josh Floyd. Bookmark the permalink. Thanks Josh. Awesome work and very scary area numbers. Just for Australia too?!. I wonder how it would play out in Western Europe or mainland USA? I seem to recall reading somewhere that an area the size of Belgium would manage the wind power needs for Europe. I mean what has Belgium offered the world apart from Hercule Poiret; seems a fair sacrifice. Hi Peter, yes, that’s a question that came to mind for me too on looking at the numbers (and David MacKay’s Sustainable Energy–Without the Hot Air deals with that more directly). I think it’s understandable that many people would look at the in-principle land area required to harvest renewable energy on a scale equivalent to current fossil-fueled energy use, compare that to total available land area, and conclude that it seems doable. While Australia is clearly in a better situation than Europe, with Europe the proximity to North Africa is usually brought into play, and on that basis the scale involved seems less daunting. But my sense is that this misses a key point. In thinking about land area for renewables, it’s industrial built environments that we should be taking as the basis for comparison. In other words, what would the required land area be for renewables, compared to land areas currently occupied by similar industrial infrastructure? That then gives us a way of coming to terms with the scale of transition that’s envisaged, as we have a better idea of what was required in terms of time, capital(s) and institutional arrangements for that existing infrastructure. I think when we see the end product of industrial and urban development (or for that matter, when we look at a landscape that hasn’t been developed in this way, and project on to it future visions) it can be easy to underestimate just how much work is involved in that sort of transformation. We’d probably do well to learn to envision in terms of those dynamic processes of transformation, rather than in terms of end states.